So Oprah has always talked about doing a daily gratitude journal and how much it has improved her life in so many ways. I can see where it would be good to sit down at the end of your day and jot down what you were grateful for that day. It is a great reminder for sure of the blessed lives that we live. I have done this a few times but never faithfully. I just never stuck with it for more than a few weeks at a time. When I am getting in bed at night, I don’t tend to think of the things that I am grateful for but the things that I regret not doing that day. Today I spent the entire day with Donnie here at home with me and I regret not loving on him more. Yes I could say we were so busy with the kids, cooking, cleaning, football (yep, football) but that would just be a cop out, excuse, whatever you wanna call it. The day is now over and I KNOW that I could have spent this day better by really engaging with my sweet husband. What a freaking waste!!!!!! My loss for sure! AHHHH! Makes me ill at myself! Anyway, enough purging my irritation with myself here. I decided that instead of journaling what I am grateful for every night, I will journal what I regret I didn’t do, say and so on. Maybe I will be become more conscience of how I am spending my time and the next day I will be sure not to make the same mistake. If I was truly brave, I would post it here every night but I don’t know that I have the courage to let everyone know me that well. 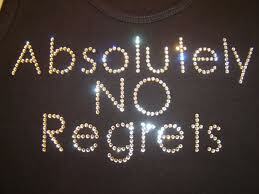 hmmmm…..will I regret that one day??? Who knows. But for now I’m gonna go snuggle with my sweetie!! Mel's World is running on a WordPress engine, with a WhitePlus body kit developed by Militaru.